When winter is knocking at the door, and the ski season is about to start, it is high time to check your wax case. Because waxing the skis is absolutely vital. Ski wax has many functions, it protects the lining against oxidation and corrosion, as well as improving the running or climbing performance, depending on the wax, of the skier. There is both hot wax, which is applied with a waxing iron like an iron, as well as other varieties which are used cold like rubbing wax or wax spray. Manufacturers such Toko, Swix, Holmenkol and Dynafit offer a wide range. There are basically two different types of wax: Glide and grip wax. The first is perfect for speed, while the second improves grip for cross-country skis, so that you can ski uphill. A ski is able to slide on the snow because of a thin layer of water which is formed by the friction between snow and ski. Glide wax on the ski makes sure it can push off. Often a layer of universal wax for large temperature ranges is used to ensure a basic impregnation. For finishing, there are various waxes in different temperature ranges. Grip wax is designed for cross-country skiers and it is applied only in the middle of the skis in the kick zone. For extremely cold and extremely wet conditions there are klister waxes, which are much softer than hard wax. Universal wax can be used in a very wide temperature range, often you can find one universal wax for positive and one for negative temperatures. This distinction is enough for casual skiers, but amateurs and racing professionals rely on a finish with very specific waxes. 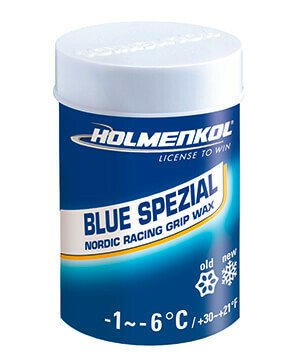 Since the temperature can change during a race day, rubbing wax can be used just before the start for the final tuning. Proper temperature choice is vital for cross-country skiing, where you need to climb. Without the correct wax, the ski can break or tunnels can form under the ascending surfaces. A well maintained ski wears less rapidly and are more fun to use. This applies to piste skiers as well as for touring skiers, snowboarders, cross-country skiers and backcountry skiers. Care equipment doesn't just include the wax itself , but also a wax iron or other wax equipment, an edge grinder, various brushes and a scraper. Tip: Touring skins aren't affected by damp snow as quickly when they are treated with wax.